As you age, sometimes it becomes more difficult to take good care of your teeth. Elderly people can develop arthritis or tendon problems that make it difficult to adequately keep their teeth clean. This can also affect an elderly person's ability to floss properly. If you are taking care of an elderly person you have to understand the importance of oral hygiene and the challenges this presents to the elderly person for whom you care. It is especially important to understand that poor oral hygiene does not just affect your teeth. Problems with your teeth can lead to an environment that allows bacteria to thrive and gain entry into your bloodstream. This can cause cardiac and other problems that could have been avoided with good oral hygiene practices. 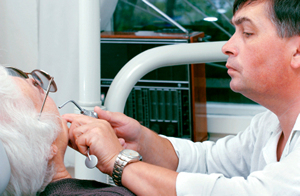 Don't fret if the elderly person you care for has lost the ability to care for their teeth with the usual tools. Technology advances and that means new tools are created to help solve problems that arise. If you have an elderly person who can't brush their teeth properly consider getting them an electric toothbrush. This device will do the up and down motion for them and all they will have to do is place the toothbrush across the teeth. This is frequently easier for them to do. Flossing can be difficult for a lot of people, but it is more difficult for the elderly. Fortunately, you now have a pre-loaded floss holder that makes flossing easier. You can also get a water pic that is usually used by folks that have orthodontia. Braces are notoriously difficult to clean and the water pics facilitate the cleaning. They work well for the elderly as well. Additionally, if the elderly person you are caring for has dentures, ensure that you ask how they fit. If you notice sores in the mouth or see that they are slipping, take them to the dentist to have their dentures adjusted or replaced, if necessary. Please contact our office if you have any questions about your loved ones oral health.